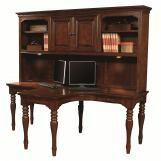 Transform your work area the focal point of your home with the E2 Villager Home Office Collection from Aspenhome. This collection’s ergonomic designs contain features such as convenient AC outlets for optimum power cord management, curved desktop shapes and comfort seating to encourage correct posture, maximum work surface area, and sufficient storage to keep your workspace clutter free. 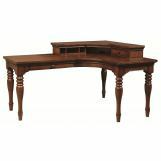 Constructed from hardwood solids and cherry veneers, built with durability and reliability in mind. Combining individual pieces to make a remarkable multiple piece sets to make an impressive statement in your home. 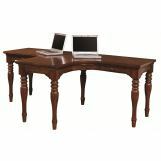 Complete with a warm cherry finish, this wonderful collection will surely turn your workspace into a centerpiece for your whole family.